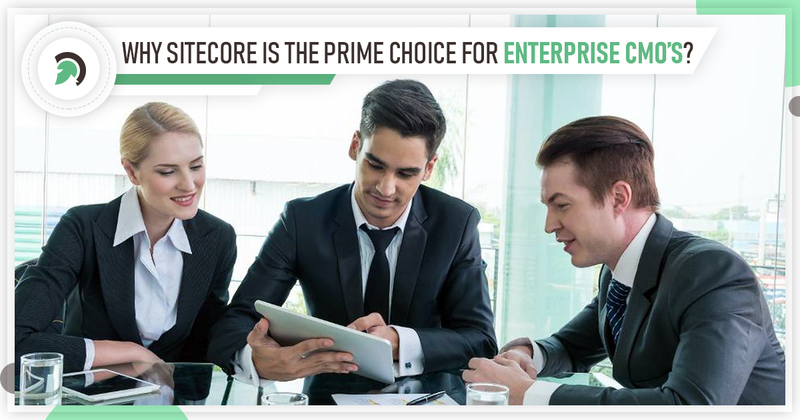 Home Microsoft Solution Why Sitecore is Perfect for Enterprise Development? In this digital world, where most of the advertisers and marketers sifted their way from traditional advertising to digital marketing, there’s have been over growing competition between companies. To stand out from the crowd and to perform well among their audiences, they need a one-stop portal which must be capable of handling all tasks like Web Content Management, Digital Experience Delivery Platforms, and Multi-Channel Campaign Management. Companies use their website to get connected with their potential audience and website is the basic source for any marketers to identify their customer behavior, it is also very useful in analyzing their data to deliver relevant content to their users. In this gigantic competitive environment where every marketer tries to overrule their competitors, we can’t rely on a single website. We need to expand our boundaries with other web resources like social networks, print media, branding and more. In this case, there is a need for an up-to-date CMS which Sitecore is making possible. Evince Development is a well-known web development company which has been awarded as a best web development company in USA consecutively by the clutch in the year 2017 and 2018, we are now striving to prove our excellence in Sitecore Development . Sitecore is mutually organized and powered by .net CMS, commerce and digital marketing tools. It is an, of course, best digital experience software used by businesses globally to create personalized and seamless digital experiences. Sitecore comes with the key products like Sitecore Experience Platform (XP) which combines all marketing activities under one head like content management system (CMS), Sitecore Experience Manager and Sitecore Experience Database (xDB). Sitecore Experience Accelerator (SXA) – It is best for marketing websites quickly and seamlessly. Sitecore Experience Commerce: It integrates content with commerce to increase conversion rate and ROI. Our modern-day customers are available on multiple channels like mobile, tablet, desktop, phone, store, and email. Sitecore works seamlessly across every device and we can measure campaign success and personalize content through all customer touch-points with ease. You can reach out to your customers more easily than ever and make them feel really special with personalized emails, newsletters, forums and more. From an Executive’s Point of View: Executive is the one who is committed to spending their organization’s money in a manner that it meets the organization’s internal needs with efficiency. These three Sitecore utilities make it cost effective and a powerful content management system for executives. Inbuilt Applications: Sitecore comes with inbuilt marketing tools like Web Forms for Marketers (WFFM) and Email Experience Manager (EXM), allowing executives more time to focus on marketing without worrying about designing newsletters, forums or email pitches. Security: The Sitecore security protocol helps you to grant or deny access for every single user of a website. Executives have the power to grant access to the users for the items and content on their websites. Integrations: one of the biggest benefits of Sitecore experience is that it can be merged with most of the previously used software like CRM and salesforce with ease for a seamless transition. From a Developer’s Point of View: There were times when developers spend days in making minor changes through the websites, but with the Sitecore augmentation, they just need a few tweaks. Here are some advantages for developers as well. Deployment Options: Sitecore CMS allows developers to integrate and write an unlimited amount of codes across multiple sites in a lesser time. Design & Content Separation: Sitecore is next generation CMS solutions for enterprises which offer both content management and content delivery, allowing developers to keep CM and CD into ideal departments. This distinction helps in raising performance, scalability, security, and administration. Lifetime Support: Sitecore offers full fledge support for developers over online communities, training courses, user groups in a way of multiple answers and techniques. These options can easily assist developers during technical glitches. From a Marketer’s Point of View: Sitecore can help marketers in numerous ways, whether it be building a strong communication base or creating brand awareness. Here are three advantages which help marketers to overrule their competition. Multi-Channel Marketing: Sitecore allows marketers to share their website content in the form of emails and newsletters. Whenever you post a new blog or an article, you can send it over to your subscriber’s email with the help of the Email Experience Manager (EXM) or Social Connector Interface. Marketing Automation: With Sitecore EXM plan, sending emails becomes more efficient than ever. You can send emails automatically by creating email funnels for your users to give them regular updates. It not only saves time for your marketers also for content managers as well. Experience User Profile: Gathering user data is an integral part of the sales and marketing efforts. With Sitecore, you can easily track users, who are interested in your service using the Experience Profile and Experience Database (XDB). Designing User Interface: Sitecore comes with a custom user interface, allowing content developers to edit their website through the Experience Editor and the Content Editor. Sitecore also receives timely updates for efficient workflow. Recyclable Content: Sitecore allows developers to reuse existing content to create new pages and modules over their websites. Search Engine Optimization: Sitecore comes with pre-built SEO tools which allow developers to make content according to search engine algorithms. Google has 200 algorithms to rank a website on top of search engine. Here, you can track content that can affect search rankings and easily improvise it according to search engine guidelines. You can change the title, meta tags, descriptions and deploy keywords as well. SEO results in higher search results, higher revenue, and brand awareness. Hence, you got to know that why Sitecore is a perfect content management system for marketing managers, digital entrepreneurs, and business owners. Is AI a Hot Solution for Web Development Company? How Digitalization Transformed Old Trends of Hospitality and Tourism Industry?